Save your home – and sanity! The Connection has the right party for you! We offer a variety of parties for all ages. All parties require a non-refundable deposit of $50 to reserve a date, up to 3 months in advance. Balance of payment is due one month prior to party date. Contact us for registration and information (908) 273-4242. Maximum of 20 guests, except where noted. BYO cake, refreshments and decorations. Download our birthday party brochure for more information! Party goers will enjoy play time in our big gym along with age appropriate activities led by our enthusiastic party staff. Each child must be accompanied by one adult. During the last 1/2 hour of the party, participants can enjoy cake or snacks in the party room set up with tables and chairs. 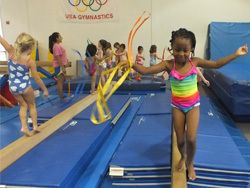 Enjoy our state-of-the-art gymnastics center for 1 hour of age appropriate play and music. 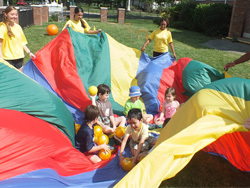 Our enthusiastic staff will lead the activities including an obstacle course, 30 foot parachute and other games. The remaining 1/2 hour is to serve snacks and cake in a separate room set up with a table and chairs. Appropriate gym attire required. *21-25 children $30 additional. This party includes 1 hour of planned activities led by our staff. Our games are all non-competitive and fun with background music, concluding with the 30 foot parachute. The remaining 1/2 hour is to serve snacks and cake in one of our rooms set up with tables and chairs. Saturday 3:00-4:45pm | Sunday 3:00-4:45pm. Invite friends to splash, swim and party with you. A personal host provides fun, games and assistance the entire time. Includes 45 minutes in a separate room, to serve your cake, set up with tables and chairs, followed by 1 hour in the pool. 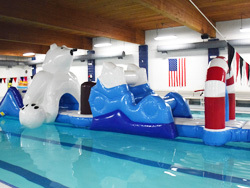 A great addition to our traditional pool party – climb and slide down our 9ft. tall slide! This exciting, gigantic 18 yd. float is unique to The Connection! Navigate through our new obstacle course! Hop through penguins, shimmy past the igloo, climb under the polar bear and slide down the iceberg!